This Blueberry Pie Lush is a quick and tasty dessert with blueberry pie filling. Do you like blueberries? If the answer is yes, I‘m sure you love blueberry pie filling, too. 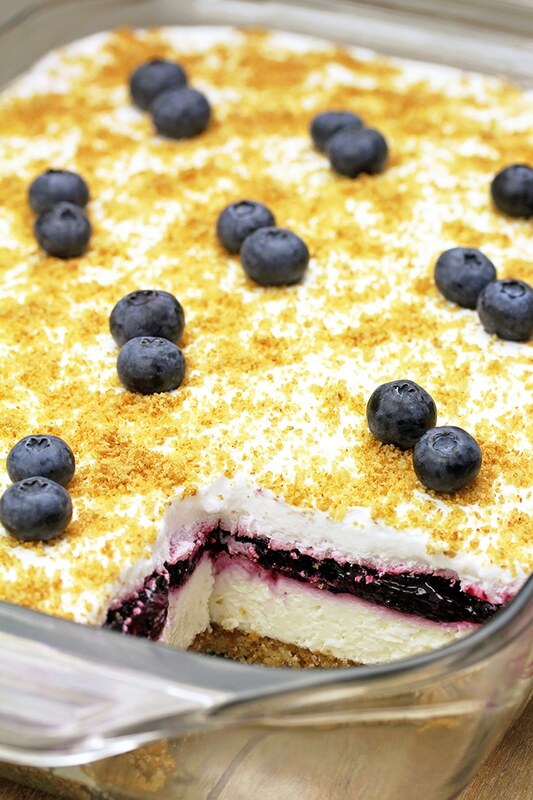 Every fruit dessert fan will be delighted with this one where blueberry pie filling dominates. I like using pie fillings in other desserts, not only pies, especially combined with cream cheese. 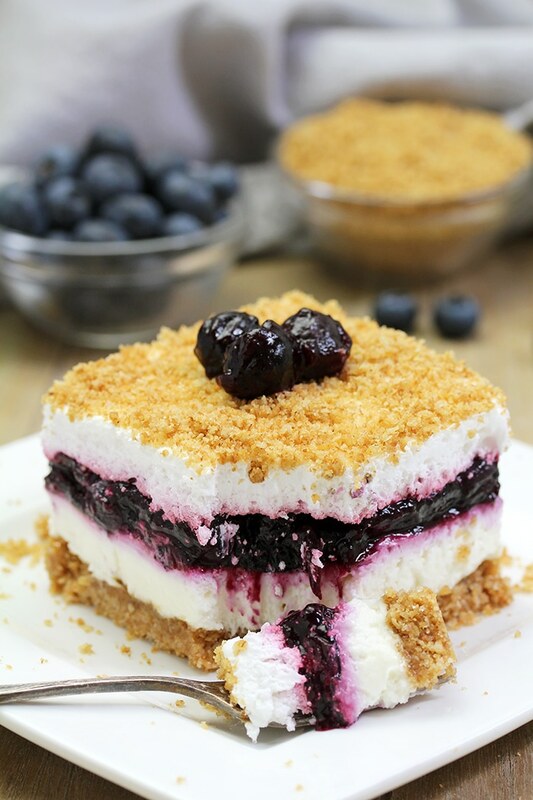 Blueberry Pie Lush has many layers that make a perfect combination of flavors. The base is made of graham cracker crumbs, sugar and butter. It‘s baked for 8 minutes. The other layers are no bake. The first one is made of cream cheese, cool whip, melted white chocolate, vanilla and sugar. The second is blueberry pie filling. The third is cool whip. Graham cracker crumbs get on top. 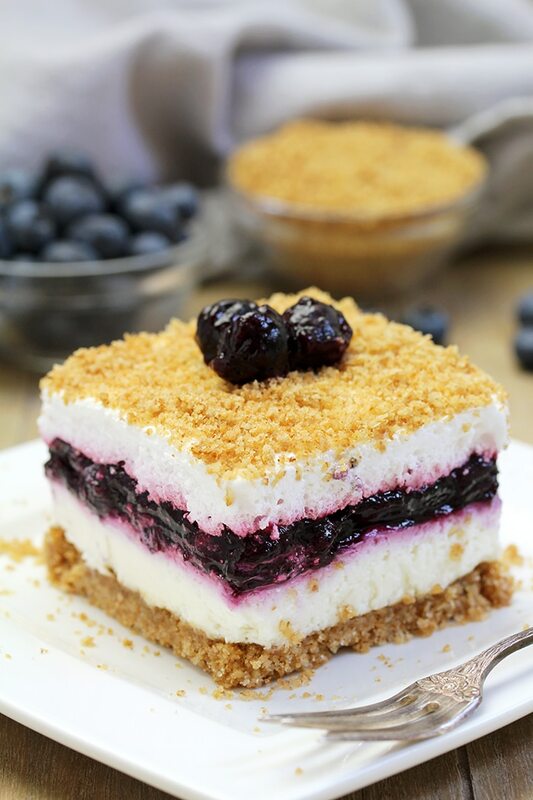 You can use fresh blueberries or those from blueberry pie filling for decoration. 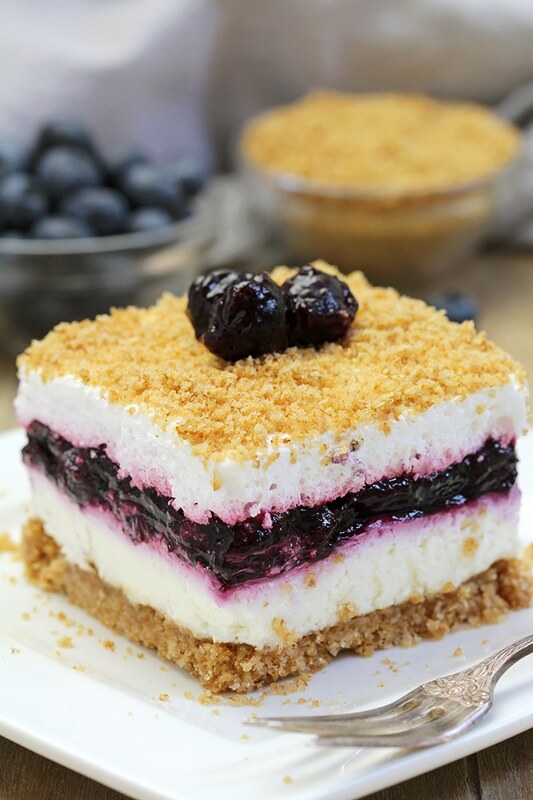 Yummy… This dessert looks perfect and the taste is divine. I especially like the fact that it‘s so easy to prepare. It‘s light and refreshing, perfect for warm spring and summer days. It‘s great for special occasions and celebrations, as well. As a matter of fact, you can enjoy it throughout the whole year because blueberry pie filling is available at any season. To tell you the truth, this dessert doesn‘t last long in my home, it‘s so light and tasty so we empty the bowl quickly. Blueberry pie Lush is a kind of dessert you will always come back to. All of you, who like Pie Fillings, check our Recipes: Caramel Apple Chimichangas, Layered Apple Lasagna Dessert and Blueberry Cheesecake Chimichangas. If you like Blueberries, take a look at our most popular Recipes with Blueberries: Blueberry Lemon Yogurt Bundt Cake, Blueberry Peach Fritters with Vanilla Glaze and Strawberry Blueberry Icebox Cake. Dessert fans should check out our category Desserts. 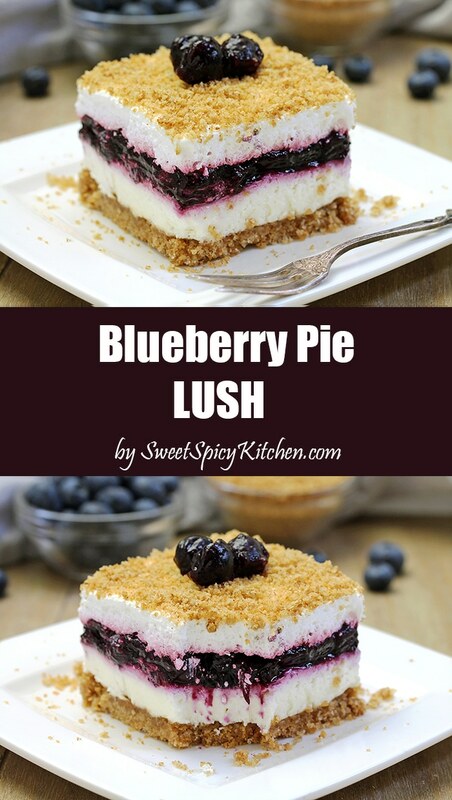 I like fruit, pie fillings, cheesecake and light and refreshing desserts, so I love Blueberry Pie lush. Try it and enjoy! This Blueberry Pie Lush is a quick and tasty dessert with blueberry pie filling. To make the crust: Preheat the oven to 350F. Put 1⅔ cup of graham cracker crumbs, melted butter and ⅓ cup of sugar in 9*13 inch baking pan, that has been sprayed with non - stick spray. Combine well and press firmly using your hands, or a solid object to form a layer. Bake for 8 minutes. Take out of the oven and leave to cool completely. First layer: Melt white chocolate following the instructions given on the package and leave to cool. In a large dish put cream cheese, ⅔ cup of granulated sugar and vanilla and beat until smooth. Add cooled, melted white chocolate and beat until well combined. Fold in the ½ cool whip. Spread evenly over the completely cooled base. Second layer (Blueberry Pie Filling): Spread evenly over the cheesecake layer. 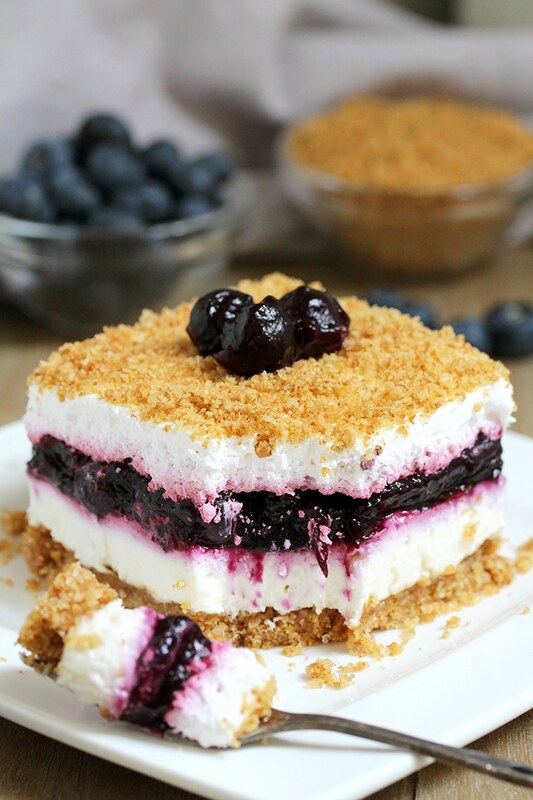 Third layer: Spread evenly the remaining cool whip over the blueberry pie filling and drizzle with the remaining graham cracker crumbs on top. Keep refrigerated for at least 4 hours, possibly overnight. 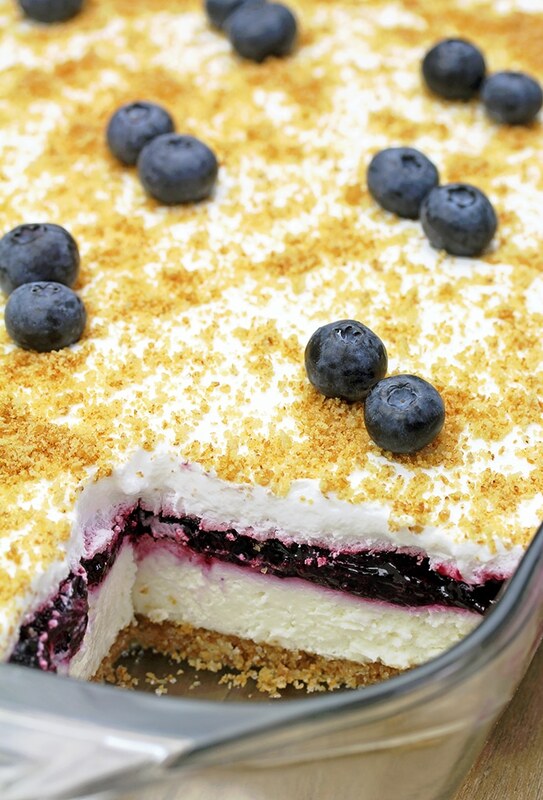 Decorate with fresh blueberries or those from the filling, before serving. Serve cooled.